Since I last posted I haven't finished a book or made any knitting progress to speak of, so I thought I'd share my To Read list with you. I'm keeping track on Good Reads now (rather than my old-timey Word document of the past) so this list is cobbled together from that and my library hold list. 1. Juliet, Naked by Nick Hornby. I love him and I'm looking forward to seeing him read next week! 2. Serena by Ron Rash. Recommend by Jennifer Weiner on her blog. I've tried to foist this on my book group, and will probably try again. 3. Her Fearful Symmetry by Audrey Niffenegger. But will it be as good as The Time Traveler's Wife? 4. Chang and Eng by Darin Strauss. A fictionalized account of the famous conjoined twins, who I have always found fascinating. 5. Fat Cat by Robin Brande. A YA novel that got a great review on Reading Rants. 6. The Braindead Megaphone by George Saunders. This is a book of essays, which is an odd thing to appear on my list, but this guy wrote the introduction to something I read (I think one of Nick Hornby's books, maybe The Polysyllabic Spree?) and it was fantastic! 7. The Physick Book of Deliverance Dane by Katherine Howe. I read a number of positive reviews on this book which takes place in Salem, MA and moves between present day and the time of the witch trials. I'm a sucker for anything about the Salem witch trials. 8. Recipe for America: Why Our Food System is Broken and What We Can Do To Fix It by Jill Richardson. The author writes one of my new favorite blogs, La Vida Locavore. Also, I am obsessed with food. 9. The Swan Thieves by Elizabeth Kostova. By the writer of the Historian, which I loved. 10. The English Patient by Michael Ondaatje. I don't know why I still haven't read this. 11. Secrets of Eden by Chris Bohjalian. 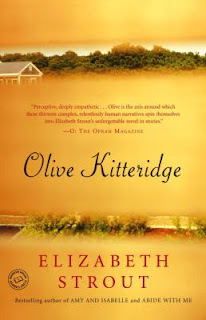 Forthcoming novel from one of my favorite authors. 12. Hate List by Jennifer Brown. A YA novel in transit to my local library as we speak. Expect a review in the next couple of weeks! 14. Shelf Discovery: The Teen Classics We Never Stopped Reading by Lizzie Skurnick. Need I say more? 15. Farm City: The Education of an Urban Farmer by Novella Carpenter. I kind of want to be an urban farmer. Or more specifically, I want chickens. 16. Almost Perfect by Brian Katcher. Forthcoming YA novel with a transgendered character. I read a really great review on Reading Rants. 17. The Raw Milk Revolution: Behind America's Emerging Battle Over Food Rights by David E. Gumpert. I think I heard about this on La Vida Locavore. I don't know if I'll manage to read the whole book (it's non-fiction, after all) but I'm really interested in the issues. 18. Empire Falls by Richard Russo. I've only read one of his books so far - shame on me! 19. Isn't It Romantic? by Ron Hansen. Kevin is always talking about how great this book is, and it's pretty short so there's no reason not to read it. 20. Overqualified by Joey Comeau. Hilarious sounding book about a guy who starts telling the truth in his cover letters. The author also writes a web comic. 21. The Gone-Away World by Nick Harkaway. It's an apocalyptic novel, which is all I need to know. 22. The Help by Kathryn Stockett. Well reviewed novel about the relationship between three women of different social classes in 1960's Mississippi. 23. The Song is You by Arthur Phillips. A novel of romance between a musician and a music lover, which kind of doesn't sound like my sort of book, but the reviews sold me on it. 24. That Old Cape Magic by Richard Russo. I loved Bridge of Sighs, and when I heard him read from this new book I knew it had to go on my list. 25. True Compass by Edward Kennedy. I have great intentions, but I still haven't read either of Barack Obama's books. Someday I will accept that I don't read non-fiction, but in the meantime I feel that as a Massachusetts resident, this is required reading. 26. Splendor: a Luxe Novel by Anna Godbersen. I love this series! 27. Moloka'i by Alan Brennert. My book group is reading this. Although I'll miss the next meeting, I still want to read it in solidarity. Plus, it looks good. 28. Catching Fire by Suzanne Collins. The long-awaited sequel to the Hunger Games. I was mysteriously deleted from the hold list, but now I'm back on track. Hopefully all the people ahead of me read really fast. My list tends to be a little too ambitious, but I'm trying not to add many books that I won't actually read. A few non-fiction books made it on here, and I'll be happy if I read just two or three of them. There are also some authors who I really want to read more of, though I don't have specific books to add to my list. These include (but are not limited to) Stewart O'Nan, Douglas Coupland, and my new friend, Charles Dickens. Just kidding. But this was just too good not to share. It's from "Woman's Day Knitting Book" (actually a magazine) dated Spring 1973. My mom totally could have knit this while pregnant with me. I wonder why she didn't? It calls for Red Heart yarn, so this would be easy to knit even today without the pesky substitutions required for most vintage patterns. 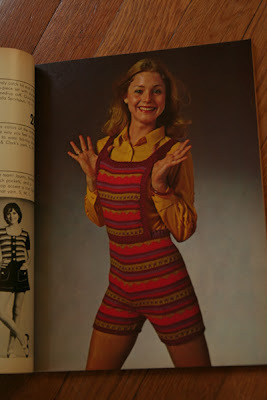 The description reads: "Glorious colors of the rainbow reflect the way you feel in fun to knit, great to wear bib-top shorts." Yes, when I think fun, I think knitted bib-top shorts. Edited to add: Thanks to Trinity for alerting me to the Overalls of Shame on Ravelry. The project is here, but if you aren't on Ravelry you can see photos at the blog post here. Do check it out! Yarn: Brown Sheep Lamb's Pride Worsted. I bought 6 skeins, but only used 5. Yarn and buttons are from Windsor Button in Boston. Thanks, Annmarie, for helping me pick out buttons! This took me 4 and a half months to knit, which is actually not terrible considering that I knit some other things during that time as well. It fits perfectly. (I deliberately made the arms a little long.) While I was working on it, the bottom band kept flipping up and I was worried about that, but it blocked out very well. I like the stitch pattern a lot, and tried to get buttons that didn't stand out too much because I want this to be a versatile garment that I can wear with anything. 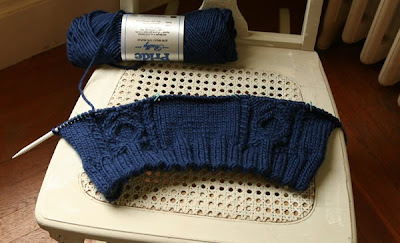 - Paid more attention to the relationship between the stitch pattern and the raglan decreases. I think pattern designers give us all a little too much credit for being able to figure this kind of thing out on our own. By the time I figure out what I should have done, I'm way too far through the thing to change. My raglan seams look fine, just not perfect. - On the collar I would have done the decreases at the 2nd and 3 markers as indicated (which I didn't understand from the instructions). I think it would have only been one more decrease, but that may have helped. As it is, the collar doesn't sit quite right, though it may only be noticeable to me. - I would not have used whip stitch to attach the collar. It doesn't look good, but I don't know what else to do. I can't figure out what the designer actually did. The only other way I know to attach pieces is mattress stitch, which creates a seam. That doesn't work here - it eats up the edge stitches so the collar isn't the same width the whole way around. I don't know what I would have done, I guess, other than pressed the designer for more details or maybe posted something on Ravelry. 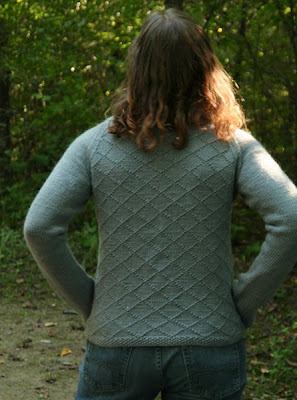 - Again with the collar - I would have knit from both sides of the neck to meet in the middle because the kitchener is visible and I would prefer it on the back of my neck, not the front of my shoulder. Perhaps there is a way to kitchener the seed stitch to make it invisible but I don't know how, so I should have done this differently. I wish I had thought of it earlier. (I still could have ripped back and done it, but I am lazy/impatient.) I don't think it's visible to the lay person, but I can see it. Overall, I am quite happy with the pattern and the project. New sweater, just in time for fall!